MICHIGAN TRUTH SQUAD ANALYSIS: "Pushback"
Questionable statement: "You’ve probably seen the misleading ads attacking Proposal 3 brought to you by the same folks hiking your electric bills." Citation for claim is a Detroit Free Press story of Aug. 22, with a quote of "electric rates soar." The story was about a report from an energy advocacy group that wants a 2008 state law changed that limited the amount of Michigan electric consumers who could use alternative providers. 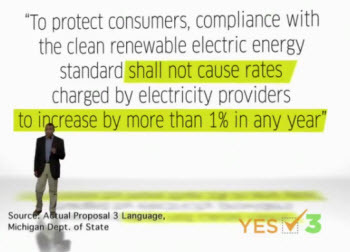 It is the same law that set the 10 percent renewable energy standard that the proponents of Proposal 3 want to expand, though via constitutional, rather than statutory, means. Spokesmen for DTE and Consumers Energy did not dispute the individual figures in the critical report, the Free Press said. And DTE and Consumers have been the largest contributors to the anti-Prop 3 ballot committee, CARE. Consumers recently filed for an electric rate increase with the Michigan Public Service Commission to generate an additional $148 million per year, or a 3.9 percent increase, Consumer says. Consumers also has a separate $83 million per year filing, which would be a 2.1 percent bump, if the first filing was approved. Neither filing would be affected by the success or failure of Proposal 3. Questionable statement: "30 states that passed do-it-all energy plans just like Proposal 3, like Illinois, where electric bills went down a $176 million." The nonpartisan Citizens Research Council says 29 states, plus the District of Columbia and Washington, D.C., have renewable portfolio standards; another eight states have a voluntary renewable goal. CRC also says Michigan would be unique in having a renewable standard in its constitution. Questionable statement: "Like Illinois, where electric bills went down $176 million. TEXT ON SCREEN: Illinois utility bills down $176 million." "The aggregate result is a savings of $176.85 million in total load payment for generation in Illinois. While this does not directly translate to dollar for dollar savings in consumer bills for the same time period, due to the fact that utility consumers are served via a portfolio of resources of different vintage, it points out the magnitude of the benefits accruing to all consumers in lowered underlying electric energy cost drivers." This is actual text from the ballot effort, but there’s far more here than meets the ear. "When fully implemented (if this proposed amendment is adopted), it is expected that non-renewable energy sources will still account for about 75 percent of the energy produced. The cost increase restriction will not hinder the ability of electric utilities to recoup the cost of producing or obtaining electricity from those sources. "Additionally, rate changes will not be constrained from increasing by more than 1 percent in any year if necessary to pay for transmission costs." The ad tries to make a voter believe that a yes vote means utility bills can't go up more than 1 percent. The ad is an outrageous misrepresentation of the proposal and the issue. Overall impression: "Pushback" tries to make the case that Proposal 3 will help the pocketbook of utility ratepayers by misrepresenting what the actual amendment would do to Michigan's energy market. 1. Utility bills can't go up more than 1 percent. That's simply false. 2. Bills for ratepayers fell $176 million in Illinois. As the cited report notes, that’s not the case.